On rainy days, Harvey leaves the clinic and walks upstairs to his room at 12:00pm, regardless of whether or not there are patients in the clinic. 9:00 AM Inside clinic, behind the front desk. 12:00 PM Leaving clinic to go to garden left of town square. 12:40 PM In the garden left of town square. 5:30 PM Heads back to clinic. 6.00 PM Arrives in clinic. 6:30 PM Goes up to his apartment. 9:00 AM At clinic, in examination room. 1:00 PM Clinic waiting room. 1:40 PM Examination room with Evelyn(2nd)/ Willy(9th)/ Leah(16th)/ George(23rd). 4:40 PM At computer, behind front desk. 6:00 PM Goes up to his apartment. 1:40 PM Examination room with Abigail(4th)/ Vincent(11th)/ Jodi(18th)/ Pam(25th). 12:00 PM Leaving clinic to go to Pierre's store. 12:30 PM Inside Pierre's General store. 3:00 PM Returns to clinic. ALL DAY In his apartment above clinic. 12:00 PM Goes up to his apartment. 5:30 PM Leaving apartment to go to the Stardrop Saloon. 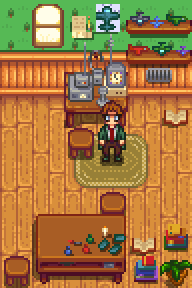 6:10 PM In The Stardrop Saloon, at the bar. 12:00 PM Leaving clinic to go stand south of fountain. 12:40 PM Standing south of fountain, behind clinic. 1:40 PM Examination room with Evelyn(2nd)/ Elliott(9th)/ Alex(16th)/ George(23rd). 1:40 PM Examination room with Sebastian(4th)/ Robin(18th)/ Demetrius(25th). 12:00 PM Leaving clinic to go stand by river. 1:00 PM Standing by river, left of bridge to beach. 1:40 PM Examination room with Evelyn(2nd)/ Lewis(9th)/ George(23rd). 1:40 PM Examination room with Gus (4th)/ Sam (11th)/ Marnie (18th)/ Caroline (25th). 5:50 PM Leaves clinic and walks to The Stardrop Saloon. 10:00 AM Inside clinic, behind the front desk. 6:00 AM In the kitchen. 12:00 PM Leaves kitchen, moves around in bedroom. 2:00 PM Leaves bedroom to stand in living room. 12:30 PM Leaves kitchen, stands in kid's room (if available). 6:00 AM Standing on the porch. 1:00 PM Goes inside, stands in kitchen. Enter the general store between 11am and 3pm. You witness a dance aerobics session with some of the ladies and, unexpectedly, Harvey. Harvey seems out of breath as the session comes to an end, heading towards the door to leave but running into you on the way. 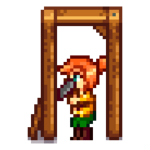 Harvey seems incredibly embarrassed when he finds out you were watching, wanting to keep it a secret. He explains that he's doing it to stay healthy, which becomes more difficult with age and the stress of running the clinic essentially alone. Harvey seems discouraged because of how difficult it is for him to keep up with the rest of the group, figuring he must not be in good shape. He asks you not to tell the rest of the town that he's doing dance aerobics. If you choose not to tell, Harvey thanks you and say that he appreciates you. Either choice has the same outcome. Harvey notices you and tells you he made contact with a real pilot. He excitedly tells you to come over to the window to watch the pilot fly overhead with him. After the plane passes Harvey opens up about how he always wanted to be a pilot when he was younger, but couldn't because of his bad eyesight and crippling fear of heights. He tells you not to be sad about it, that he's accepted not everyone can achieve their dreams and that is just the way the world is. Harvey tries to lighten the mood by asking you to look at his model planes, having just finished the TR-Starbird deluxe set. Harvey sends you a letter asking to meet at the railroad tracks. Go there between 9am and 5pm. When you meet him there, he says he's glad you came and that something should be happening very soon. A man in a hot air balloon lands nearby, says the balloon is yours for the next two hours, and heads into town for the Stardrop Saloon. Harvey tells you that he saw the hot air balloon rental advertised in the newspaper and thought it was a perfect thing to do together. Before hopping in, you can either immediately get to it or ask him why he did this, since you know about his incredible fear of heights. If you opt to ask him, he bashfully explains that while his fear is still a major factor, he admires you and your courage and says that it should be more than enough for the both of you. Boarding the hot air balloon, Harvey switches on the burner below to make it ascend but freaks out once he realizes how fast it's rising. High in the sky his mood oscillates between fear and elation, eventually coming to his senses and remembering that you're there with him. He marvels at how much he can see below and is glad that he's doing this with you. Soon before the two-hour rental is up, you draw close into a kiss. 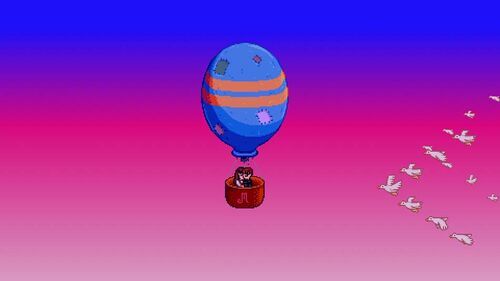 You return the balloon to the rental man at least a half hour late. 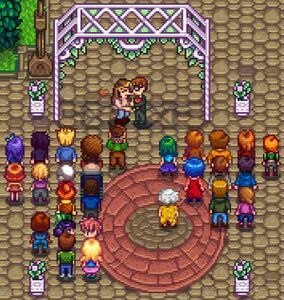 To marry someone, you will need to raise their friendship level to 10, as well as have given them a bouquet (which can be bought at Pierre's store). You must acquire a Mermaid Pendant from the old mariner on the beach, in the area accessible only after repairing the bridge. You can then give the pendant to the person you desire and they will prepare the wedding, asking for three days to do so. 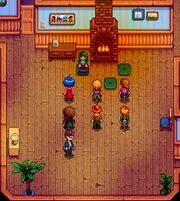 If the player marries Harvey he will move in to the farmhouse and help you out on the farm. He will occasionally give you Complete Breakfast in the morning. He will continue to work at the clinic, and travel to town to work there each day. After marrying him he'll have a small room added onto the farmhouse where he'll have a ham radio and some small model airplanes. He'll also setup a small potted plant garden behind the farmhouse where he'll go to read. Harvey's look evolved over the years the game was in development. Here's a timeline showing how ConcernedApe's art and Harvey's style changed over the years before the game was launched. In Russia, doctor calls you! During the eight-heart event in his room, he mentions that his coordinates are 52 North, 43.5 East. In the real world, this would put his location in southwest Russia, between Ukraine and Kazakhstan. When married to the player, he may admit a fondness for jazz music, as he listens to it when finalizing his medical reports. Despite telling others to eat healthily, his fridge is filled with convenience food and his microwave oven is well-used. Inside the Clinic while he is working, you can find several plaques on the wall. 1 States that the clinic is licensed by the Ferngill Republic Health Authority. Another is an advertisement for proper sneeze etiquette. A third in the back is an advertisement for a fictional drug Pravoloxinone which has the side-effect of "Complete disinitegrtation of one or more bones" for 1 in 500 patients. Yet another near the back right of the clinic is described as a symbol of Yoba. If you activate the ten-heart event while the train is passing, the game will soft-lock.